Mardi Gras, French for Fat Tuesday! 1 Comment on Mardi Gras, French for Fat Tuesday! The English translation of Mardi Gras means Fat Tuesday, but it sounds so much better when you say Mardi Gras. Fat Tuesday is the last hurrah before beginning the christian season of lent onAsh Wednesday. It is a late winter celebration that some believe is the welcoming celebration of the spring season. The traditions of Mardi Gras coincide with the European traditions ofCarnival, meaning “farewell to the flesh”. The fat Tuesday name comes from the tradition of eating a fattened calf on the last day of Carnival. Because lent begins on Ash Wednesday, these celebrations end rather abruptly at midnight at which time party goers are almost literally swept out of French Quarter in New Orleans to make way for the lenten tradition of fasting. There are many pastry treat traditions that come with the celebration of Fat Tuesday. Including the polish delicacy of paczki’s, and King’s cake. 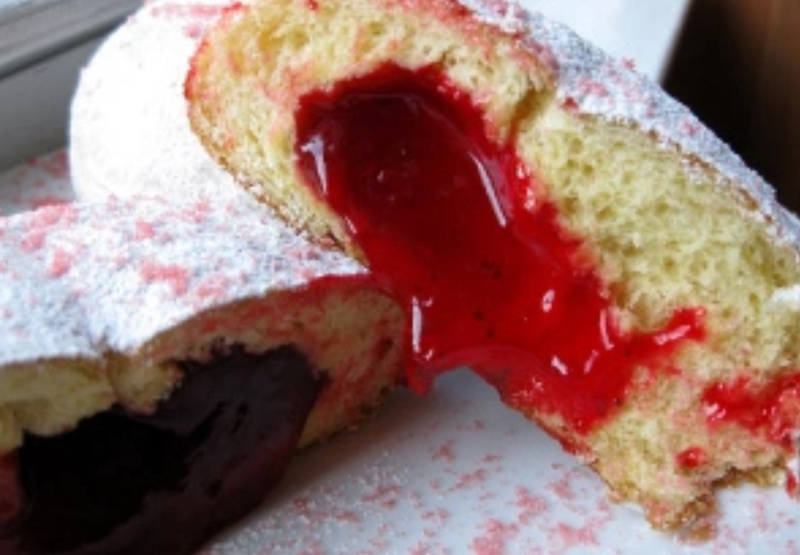 Paczkis are a rich donut pastry, on a supersized scale, that contains a custard or fruit filling, and is coated in confectioners sugar, or a glaze. They are very high in calories, and the batters used contain large amount of egg, and butter. The average paczki recipe contains 350-400 calories per donut, and boast a whopping 15-24 grams of fat! But they’re soooo good!! 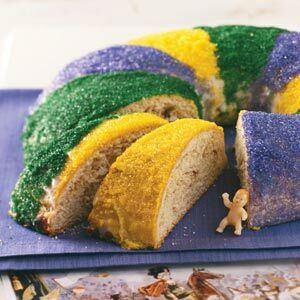 King’s cake another very popular Mardi Gras tradition is a circular shaped cake, that contains a small charm usually in the shape of a baby (representative of the baby Jesus). The person that finds the baby in the cake has special priviledges and obligations, as they are deemed the King for a Day! The cake itself has a bready texture, and is usually frosted with a thick colored glaze. There are “portable” version (donuts) served during street fair celebrations. Many bakeries now seperate the charm from the cake to avoid choking hazards. Stir the egg yolks and melted butter into the milk mixture. In a separate bowl, combine the flour, salt, nutmeg and lemon zest. Beat the flour mixture into the milk/egg mixture 1 cup at a time. When the dough has pulled together, turn it out onto a lightly floured surface and knead until smooth , about 8 minutes. Lightly oil a large bowl, place the dough in the bowl and turn to coat with oil. Cover with a damp cloth and let rise in a warm place until doubled in volume, about 2 hours. In a small bowl, combine the cream cheese and 1/2 cup confectioners’ sugar. Mix well. In another small bowl, combine the remaining 2 cups confectioners’ sugar, lemon juice and 2 tablespoons milk. Mix well and set aside. Turn the dough out onto a floured surface. Roll the dough out into a 6×30 inch rectangle. Spread the cream cheese filling across the center of the dough. Bring the two long edges together and seal completely. Using your hands shape the dough into a long cylinder and place on a greased baking sheet, seam-side down. Shape the dough into a ring press the baby into the ring from the bottom so that it is completely hidden by the dough. Cover the ring with a towel and place in a warm place to rise until doubled in size, about 45 minutes. Bake in preheated oven until golden brown, about 30 minutes. Drizzle cooled cake with lemon/sugar glaze and decorate with candy sprinkles. I hope this years Carnival finds you well, and here is to a happy, healthy, lenten season. Enjoy!